I always liked Paul Krugman, the Nobel Prizer and New York Times blogger. I just wish he liked me, I mean in my Market Monetarist hat. But at the macroeconomic ball, Krugman has been the swashbuckling swain on the center of the dance floor, and I but a wallflower. [T]he question is why starting in the 1970s much of academic macroeconomics was taken over by a school of thought that began by denying any useful role for policies to raise demand in a slump, and eventually coalesced around denial that the demand side of the economy has any role in causing slumps. Modern macroeconomics has ossified into defeatism, perhaps under the influence of that doughty school of dour-hards, the tight-money ascetics and anti-inflationistas. The latest fad in macro-posturing is that due to (unspecified) structural impediments and demographics, no modern economy can grow at more than, say, 2 percent a year, in real terms. And maybe less. Economic historians might ponder this trope of current-day pundits and theoreticians. For example, how did Americans, driving inflammable Pintos, wearing bellbottom pants and dufus hairdos, managed to expand their economy by 20 percent (real terms too!) from 1976 through 1979? When Jimmy Carter was President? The 1970s? That was pre-Internet and the instant-information revolution that accompanied it. Before free trade swelled, and before smartphones. But still with the dying hulks of Big Labor, Big Steel, and Big Autos littering the politico-economic landscape. Before the Wal-Mart import-from-China riff. Computers? We were still using Fortran cards. Somehow that economy of the 1970s was able to expand by 20 percent in four years, but we cannot now? So we can do it—but we will have to tolerate a higher rate of inflation. Given that we are threatened by ZLB…. The other defeatist meme is that Western economies are running out of workers. The population is bulging in the wrong places, like in the senior category. There is some truth in this, but only some. Surely, from 2008 to 2012 a lack of workers to fill empty slots was not the problem in the U.S.
And is it a lack of workers that is holding back economic expansion in, say, Spain, where the unemployment rate is 25 percent? Krugman is right as far as he went in the cited blog; I just wish he would come to the back of ballroom where us Market Monetarist frumps line the walls. Maybe we are not so good-looking, but if they play the right song, we will show Krugman how to really dance. In the name of honor, the Fed strives to fail! The Fed, which desperately needs more inflation in order to get the longer run federal funds rate up so that it can do its job, is planning, publicly and deliberately, to raise interest rates in such a way that its preferred inflation gauge is at most 2% for the next three years. Again: the Fed is going to intentionally undershoot its inflation target on average over the next three years, thereby ensuring that it returns to the ZLB during the next downturn, thereby ensuring that it continues to undershoot its inflation target while also missing its maximum employment target. And one can’t be completely sure, but I think the reason they intend to do this is because they fear that setting and hitting a higher inflation target would call into question their credibility. For more on the bizarre behaviour of the Federal Reserve on this front, see Brad DeLong’s excellent post here. There is a long list of reasons to think that tightening policy too fast is far riskier than tightening too slowly: there is strong evidence of considerable labour market slack in America and abroad, there is considerable disinflationary pressure radiating out from Europe and emerging markets, and the number of potential geopolitical shocks seems to grow by the day. The FOMC seems to be living in a different world altogether. And it amuses me greatly to read so many odes to (an inevitable) “Great Stagnation”. Is this the best you can get from so many highly trained (and heavily mathematical) economists? Where is the intuition that drove the great minds of the past, regardless of their particular “school of thought”. The chart provides the sickening visual! That U.S. policy since 2008 has been so much more successful than Eurozone policy even though the center of the financial crash was in the U.S., in the desert between Los Angeles and Albuquerque, should have caused the Eurozone to revise its economic policies and move them closer to the more-stimulative policies of the U.S. And it should have caused the U.S. to revise its policies and moved them further away from the hyper-austere policies of the Eurozone. But no. Which shows that real output performance of the EZ is much worse than in the US. This is put on the tab of the “hyper-austere policies of the Eurozone”. In the chart I identify the moment in 2011 that Trichet´s ECB thought it right to raise rates! That´s the moment the output behavior begins to diverge. The charts below indicate that from their peaks, the US has done more fiscal consolidation than the EZ, measured either by the reduction in the structural deficit or by the decrease in government spending. And the next chart indicates that it is more “austere” monetary policy in the EZ, not “fiscal austerity” that explains the difference in output growth. 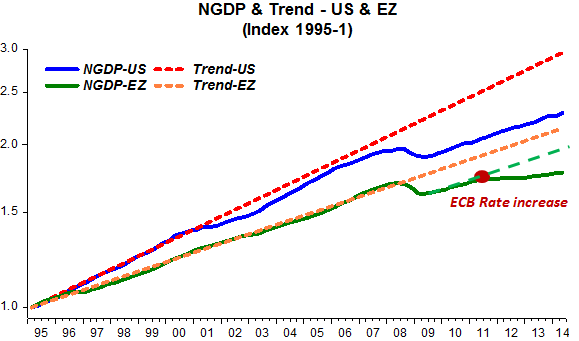 In the US spending growth has fallen to the rate observed previously in the EZ, while in the EZ it has turned flat. Note: Three years ago, many people thought that by now there was a significant probability that the Euro would have broken-up. Logic would indicate that the first country to abandon ship would have been the one most free to do so. That´s Denmark, and it hasn´t! My question to Lars: why not? 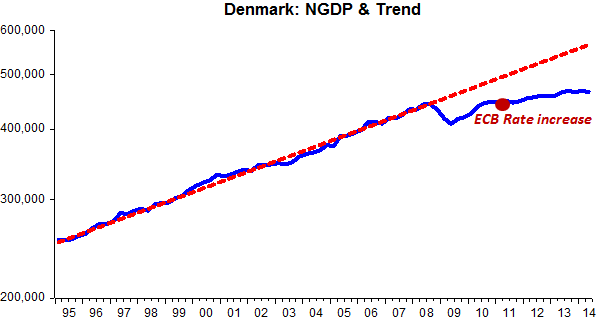 The charts show NGDP and trend of Denmark (linked to the Euro) and Sweden (totally free). It appears “freedom” is not a sufficient condition for a country to get monetary policy right! The standard textbook model says demand shocks have cyclical effects, and that after wages and prices adjust the economy self-corrects back to the natural rate after a few years. Even if it takes 10 years, it would not explain the longer-term stagnation that they believe is occurring. Krugman might respond to the first point by saying we should dump the new Keynesian model and go back to the old Keynesian unemployment equilibrium model. But even that won’t work, as the old Keynesian model used unemployment as the mechanism for the transmission of demand shocks to low output. If you showed Keynes the US unemployment data since 2009, with the unemployment rate dropping from 10% to 6.1%, he would have assumed that we had had fast growth. If you then told him RGDP growth had averaged just over 2%, he would have had no explanation. That’s a supply-side problem. And it’s even worse in Britain, where job growth has been stronger than in the US, and RGDP growth has been weaker. The eurozone also suffers from this problem. A demand-side (unemployment) problem that was severe in 2009, and (in the US) has been gradually improving since. Slow growth in the working-age population. Likely all those things are true. But why? I posit that the demand shock was so severe (and long lasting) that it greatly helped mess up the supply side. That means that now, the previous level of activity is not attainable (at least for a long time). 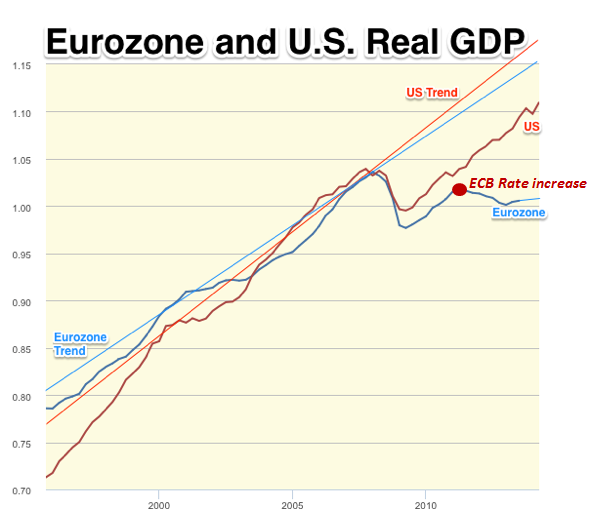 The charts indicate that all those supply side factors went “off” after the “Great(demand shock)Recession” hit, a consequence of the Fed´s (and many other central banks) “Great Monetary Policy Mistake” of 2008. The next chart indicates that the economy, even given the supply side “negatives”, could be at a higher level of activity. Closing a $1.7 trillion gap through, say, an NGDP Level Target not allowing all bygones be bygones would also do “wonders” for the supply side! In the comment thread of Britmouse´s excellent post, James in London and W Peden have an exchange in which I´m mentioned. W Peden´s comment is very long so I just reproduce a few paragraphs. (James in London): Looking forward to a revisionist critique by a Market Monetarist of the “Barber Boom”. Was it so bad? Are you listening Marcus? Now for NGDP. To set the scene for the Barber Boom: the quarterly data I have (from the “Money Creation in a Modern Economy”) suggest that UK economic policy was very good from Q2 1965 to Q4 1967, when there was a halving of NGDP growth from over 10% to about 5%. NGDP growth then picked up following devaluation, and by the end of the (perhaps overrated) Roy Jenkins chancellorship was running at about 10% again. 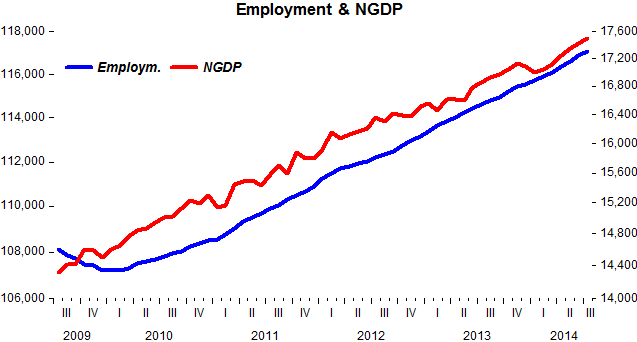 Looking at NGDP, the “recession” during the early stages of the Heath government was clearly a supply shock. NGDP growth was above trend and stable from Q3 1970 to Q1 1972, but during this period unemployment rose dramatically and RGDP slowed right down (and IIRC fell in some quarters) presumably due to the collapse of incomes policies and the reversion of unemployment to its underlying natural rate, which had risen as a result of the major expansion of the welfare state during the Wilson government. In terms of NGDP, the Barber Boom was very short. From Q2 1972 to Q1 1973, NGDP growth accelerated drastically from about 11% to over 20% as the government desperately tried to get unemployment down and RGDP growth up to 5%. 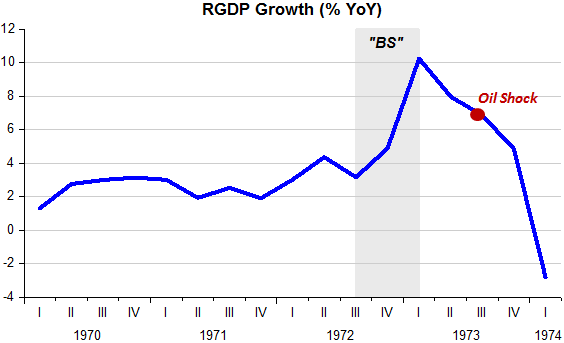 Looking at the quarterly RGDP data from Trading Economics, NON-ANNUALIZED RGDP growth reached 5.3% in Q1 1973. In other words, even by the standards of their own incorrect estimates of the output gap, the UK macroeconomic authorities expanded RGDP by more than their ANNUAL target in a single quarter. Probably the main revisionist note I shall sound is this: by the end of Anthony Barber’s chancellorship in March 1973, there was absolutely no reason why the UK needed to have >20% inflation. The monetary overhang could have been handled by a good market monetarist chancellor. Even taking Q1 1974 as a bit of an outlier, NGDP growth was coming back under control (relatively speaking) by the end of 1973, nearing 10%. Even with very pessimistic estimates of potential output in 1974-1975, inflation need not have risen very far beyond 10% in that period. And this means that the REAL inflationary boom was under Denis Healey from Q2 1974 to Q4 1975, during which NGDP and inflation accelerated far above 20%. However, the boom was ended. 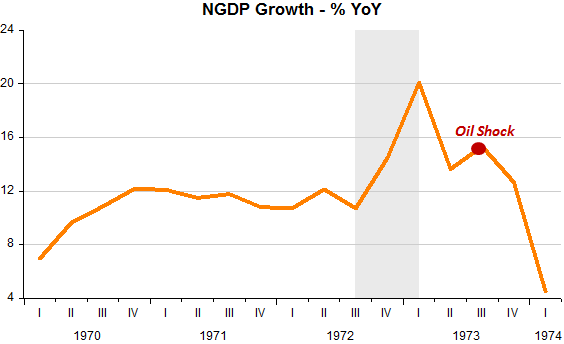 NGDP growth was brought down even more rapidly than it was raised, falling to under 5% by Q1 1974. I have mixed feelings about this disinflation. On the one hand, a mid-term government practicing a statutory incomes policy probably has the best excuse and tools for a “shock therapy” approach, and unemployment continued to fall, presumably due to a temporary shift in the natural rate of unemployment resulting from the incomes policy. Nevertheless, a recession began in Q1 1974, partly supply-driven (the oil crisis and the miners’ strike) and partly driven by the sharp fall in NGDP growth. It´s not a question of “doing a better job”, but of illustrating the period. I´m a firm believer in the “power of images” and that´s what I do below. My takeaways: The so called Barber Boom was “BS”. 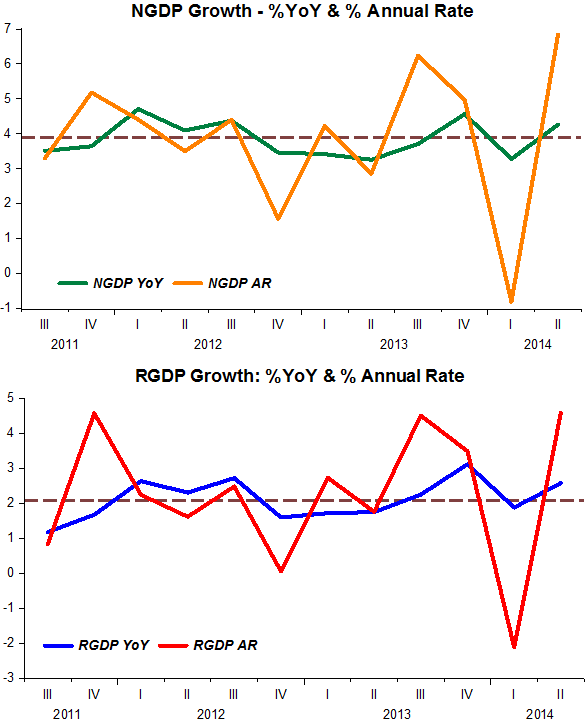 NGDP growth had been stable as was RGDP growth, while inflation was trending down. What appears to have happened in 1972-73 was a politically-driven and desperate move with eyes on a possible election in 1974-75. According to “Backbencher”: In 1972, with an election looming, Heath U-turned in a spectacular turn of events that became known as the ‘Barber Boom’. The oil shock (which erupted on October 1973) just made a bad situation worse. By constraining AD, the fall in real output was worse than otherwise (much like the Fed and the BoE, plus the ECB and others did in 2008). 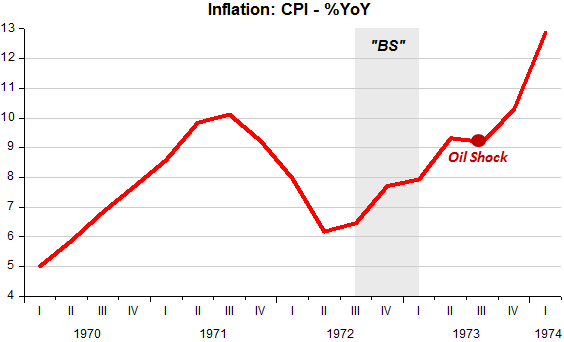 The next charts indicate that if in the US the 1970s were known as the “Great Inflation”, in the UK the period should be called one of “Mammoth Inflation”. 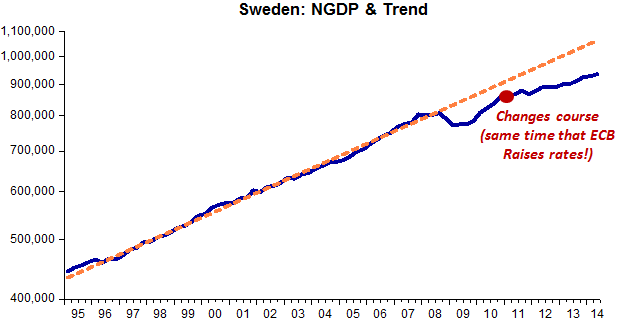 And the link of inflation with the behavior of NGDP couldn´t be more evident. Very clear. Very spiky times, but growth bulldozed on, almost regardless. Some sharp periods, but sharp recoveries. At least “stop-go” had plenty of go, and not just stagnation like today. James, not quite. Today is a different world altogether, reflecting “peoples wish” for living a Great Stagnation (see next post). 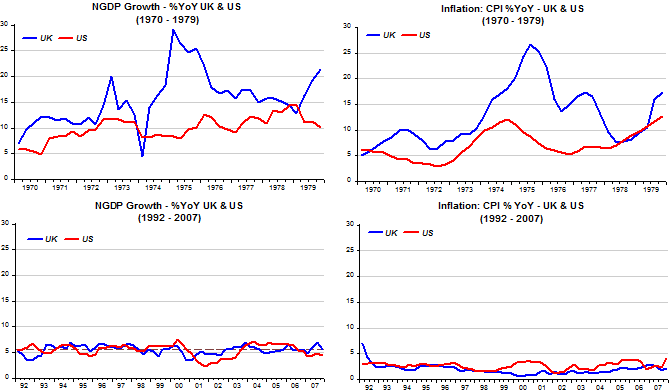 In the 70s it was “spiky times” but growth (at least in the UK) did not “bulldozed on”. The charts below illustrate. In the 70s UK average gowth was 2.6 and pretty spiky, with standard deviation also of 2.6. In the US average growth was 3.2, and just as spiky (SD also 2.6). 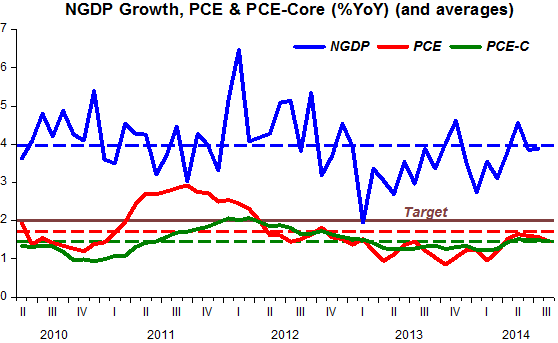 During the GM, average real growth in the US continued at 3.3. but “spikiness” fell by more than 50% (SD 1.2). Average UK growth was the same (3.3%) and SD 1.1. Certainly life was more pleasant in 1992-07! 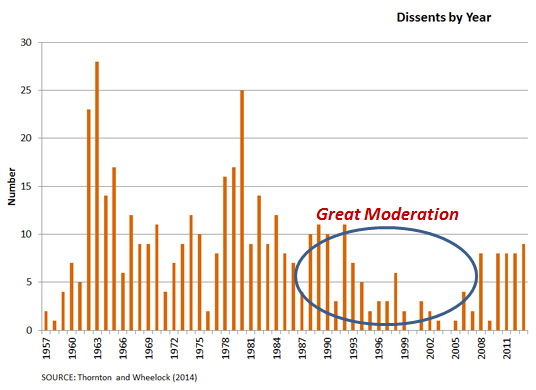 A “Great Moderation” can be pernicious. 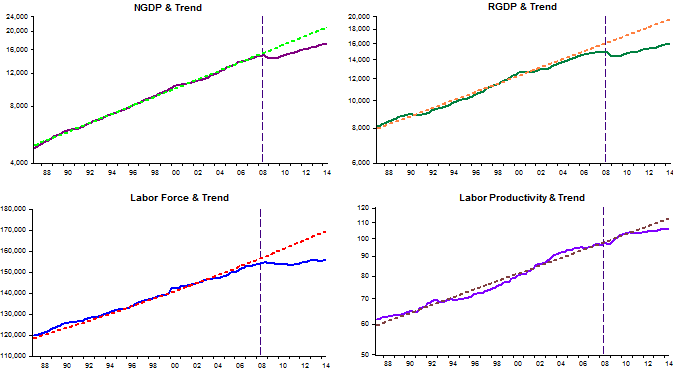 What is forgotten is the Level path along which real and nominal output growth were stable. (WSJ): The U.S. economy grew in the spring at the fastest pace since late 2011, another sign the recovery is accelerating after five years of sluggishness. (Bloomberg): “We definitely see momentum,” in the U.S. economy, said Brittany Baumann, an economist at Credit Agricole CIB in New York, which correctly forecast GDP. Those are very misleading comments as the following charts attest. After the initial bounce back in the early stages of recovery, the economy has entered a period of almost unbelievable stability in nominal and real spending. Annualized rates are notoriously volatile and shouldn´t be the basis for comments such as those above. Unfortunately the LEVEL path is too low! But this accomplishment tells us something interesting: If the Fed was able in 1987-2007 to keep the economy piggy-backing along a level path and now it is keeping the economy piggy-backing along a much lower level path, it could, if it chose to, establish a higher level path along which the economy would ride. If it is not even trying to do so, either it is woefully ignorant of its powers or it sees no alternative to keeping the economy in a depressed state, bowing to the “Great Stagnation” view! Given that Charles(Sooner rather than Later)Plosser has announced his retirement, Richard(Inspector Clouseau)Fisher has “picked up the baton”! It’s assumed in the market place that we’ll start our liftoff in raising interest rates some time between the spring and the summer,” Fisher, a member of the Federal open Market Committee, the Fed’s main policy making body said at a conference in Rome. “I won’t say what we’re saying internally, that would not be appropriate, but maybe sooner rather than later,” he said. The Fed has realized the “jobs mystery” is of its own making and therefore has no interest in “solving” it, lest everyone will know it messed-up before. The Fed has no inkling that it was responsible to start with, in which case it will never be able to solve it. And the “cyclical/structural discussion” will go on until it all becomes structural, and therefore no fault from the Fed! The U.S. job market remains far from full health despite recent progress, and requires active efforts by policy makers to help it heal, a Federal Reserve economist said Wednesday. Andrew Levin, currently on leave from the central bank while working at theInternational Monetary Fund, played down the idea that much of the weakness in the job market is due to demographic trends that are not amenable to policy solutions. Mr. Levin’s message countered that of Fed staff economist William Wascher, co-author of a recent paper that found the decline in the share of Americans holding or seeking jobs is largely the product of demographic factors, such as a rising number of retirees, rather than weak demand in the aftermath of a particularly awful recession. Also presenting on the same panel as Mr. Levin, Mr. Wascher repeated his message that, while slack remains in the job market, conditions have improved considerably over the past year. The “Great Stagnation” as the “New Normal” is becoming “conventional thinking”. Even a “Market Monetarist card holder” as Lars Christensen has advocated “forget-it, let´s go on from where we are”. The term “secular stagnation,” first used during the Great Depression, re-entered the lexicon following a speech by former Treasury Secretary Lawrence Summer in late 2013. The concept begins with a simple observation: growth has been slow. Beyond that, theories of secular stagnation diverge. For Summers, secular stagnation is an inability of the economy to get back on track toward operating at its full potential. We will refer to this as the cyclical view of secular stagnation. For others, such as Northwestern University’s Robert Gordon, secular stagnation means that even if the economy were operating at its full potential, growth would still be slow. 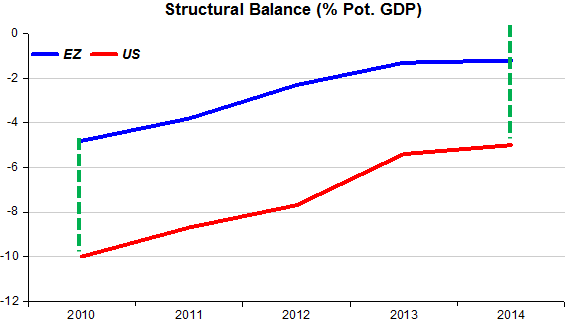 We will refer to this as the structural view of secular stagnation. In this note, we will discuss how adherence to the cyclical view actually offers some reason for hope. This is so because, by some measures, economic growth is no longer being restrained by the inability of interest rates to fall below zero. For the first time since 2008, it appears short-term nominal interest rates are not higher than where they “ought” to be. You might compare the U.S. economy to someone who’s recovering from a serious illness. At first, everyone hopes the patient will return to normal. Then it’s gradually realized that the patient suffered permanent damage and will never be the same. So, perhaps, with the economy. Since the Great Recession, the bland (often unstated) premise has been that the economy would ultimately recover in full. Now, some economists question this and argue that the economic crisis created — or exposed — enduring weaknesses. We’re at a turning point. Even when producing at “full capacity,” the economy will grow more slowly than in the past or than had been expected. So when Lucas says that the depression-preventing policy problem has been solved, he actually provides examples of what he means by depression-prevention policies. According to Lucas preventing severe recessions occurs when policymakers stabilize the monetary aggregates and nominal spending. This is essentially the same depression-prevention policies advocated by Friedman and Schwartz. Given that view, he doesn’t think that trying to mitigate cyclical fluctuations will have as large of an effect on welfare as supply-side policies. Nonetheless, Thoma’s quote and his remark imply that Lucas was wrong (i.e. that we haven’t actually solved depression-prevention). Of course, in order for Lucas to be wrong the following would have to be true: (1) Lucas says policy X prevents severe recessions, (2) We enacted policy X and still had a severe recession. In reality, however, we never got anything that looked like Lucas’s policy. The growth in monetary aggregates did not remain stable. In fact, broad money growth was negative. In addition, nominal spending did not remain stable. 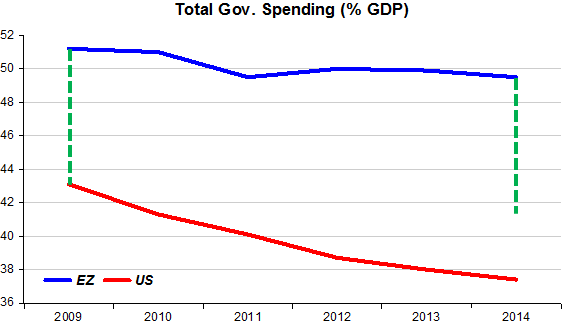 In fact, nominal spending declined for the first time since the Great Depression. We cannot conclude that Lucas was wrong about policy because we didn’t actually use the policies he advocates. 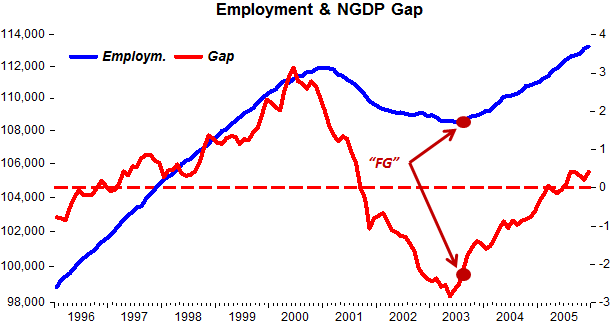 The charts below illustrate the consequences of forsaking “Lucas policies”, which help understand how monetary policy was responsible for “deep shi…g” the economy. In the first chart we glimpse monetary policy errors in the late 90s, when policy became excessively expansionary and then, from 2001 to 2003, excessively contractionary. 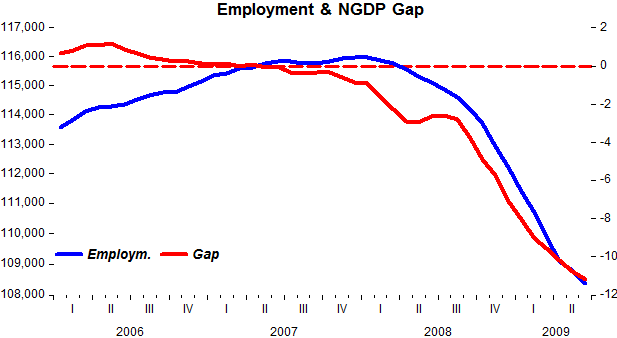 Both measured by the NGDP gap relative to the “Great Moderation” trend. Note that what became known as the jobless recovery following the recession of 2001 was not due (mostly) to structural factors but mainly to the fact that nominal spending was distancing itself from the trend level. When the Fed adopted forward guidance in mid-2003, both spending and employment move up. The next chart shows what transpired from the time Bernanke took over at the Fed, At first, when spending began to fall below trend, employment stopped rising and when monetary policy starts really tightening employment crashes. But instead of identifying the source of the mistakes, people persist in developing “secular stagnation” theses. The bad news is that we´ll likely get what we wish for!